As a valuable extension of your marketing team, DemandGen delivers Campaign Execution Services. Our team of certified marketing technology and campaign professionals will work to produce, manage, deploy and monitor your email marketing campaigns cost-effectively, so your team spends more time strategy and programs, and less time on day-to-day execution tasks. During the Alignment phase, DemandGen will work with you to define, document and implement a highly efficient campaign execution process. During this phase, you’ll be assigned a team of highly skilled, industry-certified marketing professionals for ongoing campaign scheduling, building and execution. 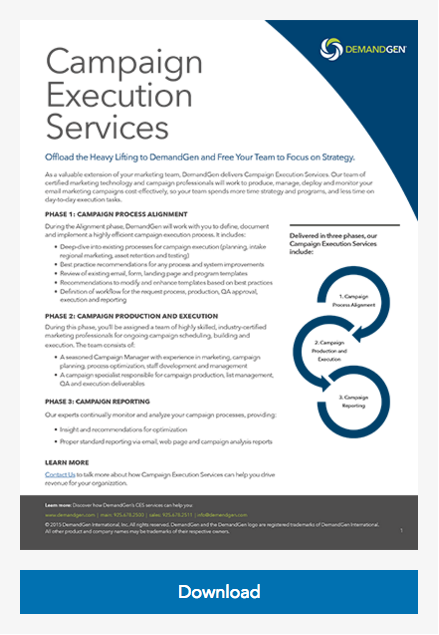 Learn more about the three phases by downloading our campaign execution services datasheet here. Contact us to talk more about how Campaign Execution Services can help you drive revenue for your organization.